If you haven’t been to Fredericksburg, you really must go. And if you haven’t been lately, make a plan. Old favorites like the legendary Carl’s ice cream and the small town charm haven’t changed there. But Fredericksburg is getting a buzz, and the warm hearted queens of the culinary hive are Joy Crump and Beth Black, business partners at three of the “must-go-to” places in the ’burg: FoodE, Mercantile and 6 Bears and a Goat Brewery. Beth and Joy, longtime friends who first met in an Atlanta newsroom, are business partners. Beth Black describes her food skills as, well, none. “Not a cook. I don’t cook. I never cook,” she says, but she keeps operations humming: “I put out the fires. Whether it is hiring staff or fixing a cooler, I try to keep the runway clear for Joy.” And Joy Crump smiles at that, she appreciates all that Beth does to let her focus on her craft, because nothing gives her more happiness than delivering food to hungry people. Ten years ago Black and Crump were working at the same news station in Atlanta, Black as executive producer and Crump as a segment producer. The journey that started there has led to a historic restored bank building in Fredericksburg. There have been stops along the way to compete on “Top Chef,” to cook twice at the James Beard House in NYC and to win several other awards and accolades, like the 2015 VA Culinary Challenge. I got to talk to these established restaurateurs over a fantastic lunch of a fried chicken sandwich, shrimp and grits, a black bean burger and pimento toast at FoodE, their first restaurant, which is now grown up from its smaller start. The space is high-ceilinged and welcoming, with a serene palette, tastefully furnished with a large portrait of Lincoln over the fireplace. President Lincoln is a bit of a touchstone as it is said he gave a speech in May of 1862 on the steps of the building where this restaurant now lives. Edible DC: So, Beth, how has leaving an established and successful career in journalism worked out for you? Beth: Well, my future may have been more certain—in that type of media job you want to keep going to bigger and bigger markets, so I knew where I would be if I had stayed there. I wanted my career to be about me, so I was willing to leave to make that happen, even though I was giving up security. Making this jump has made me so much braver. My career in media taught me how to multi-task, be a good manager, be responsive and to know what people want to know. And those skills have definitely helped me. And I keep learning so much, except about cooking. EDC: Joy, they say that one of the great human faults is being unable to predict our futures and how much life will change. Would you ever have predicted being here? Joy: In my heart, I was meant to cook. Cooking brought me incredible joy, and I thought work was work. I didn’t know that you could do things that brought you incredible joy. It didn’t occur to me until I met Beth that I could marry what I loved to do with my work. She said that you should go to culinary school. It was the “aha” moment. I should go to culinary school. I had an early-morning job so I could do both, and that is exactly what I did. EDC: And what about Fredericksburg? Joy: Well that was Beth’s genius vision. She grew up in Manassas and always loved Fredericksburg and brought me here for a weekend when they were having this incredible community event, the Great Train Race. Beth: The Great Train Race is a one-mile run for children downtown; I believe it is the largest youth race on the East Coast. We stood on a corner and watched the children run by, one little girl grabbed Joy’s hand and had her run along, and that was it. She fell in love with the town. Not to mention that it is so much less expensive than, say, DC to start a restaurant. And it is relatively affluent, with a stable fan base of locals who love to eat. And plenty of local farms. So, it’s been great. EDC: It seems like things have gone really well—was there ever a moment when you wondered if you could get support for your elevated concept of a farm-to-table menu? Beth: There were pioneers before us—La Petite Auberge, Blake and Abby Bethem who owned Bistro Bethem and now Vivify. One of my other skills from journalism is research, so when I looked at possible competition in the farm-to-table space, it came up empty. 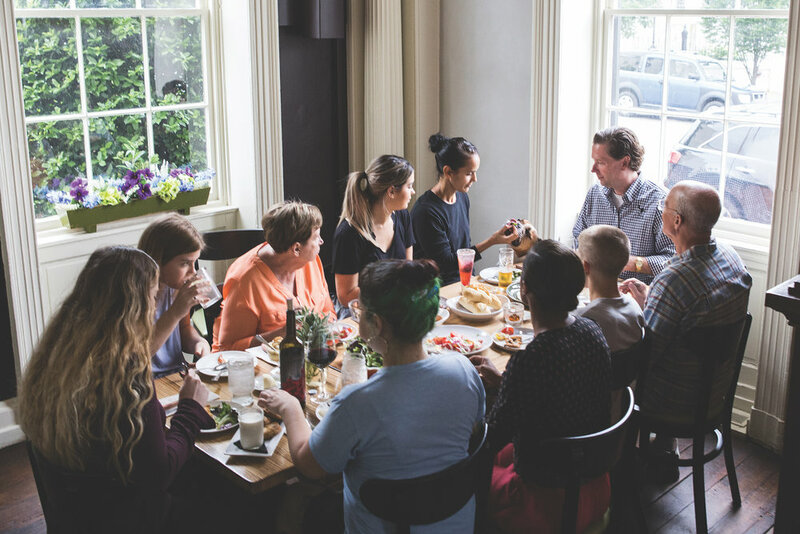 We knew there was a place in the market for our concept—very community and seasonal driven—but the local restaurant culture hadn’t embraced it yet. EDC: How did you meet and greet the farmers who would supply your first restaurant and now Mercantile too? Joy: Well, Beth has a super power called research from her background in journalism. So she compiled lists of local farms in the 22401 ZIP code (ours), then we eliminated certain people based on their growing practices and what we needed, which was protein, eggs, dairy and produce. We also worked with Milton’s Local, who is a farm goods broker. EDC: Has the agricultural scene changed here since you started? Joy: There are lots more small farms and more robust farmers markets. A lot of people grow stuff now, and people will reach out to us a lot more now than 10 years ago to be small suppliers. A lot of people have chickens. When we started FoodE, we wrote the names of our supplying farms on the menu to educate people about our philosophy and let them know who their local farmers were. We are very seasonal here. And we get excited about each one as they come—you know, like looking forward to winter and braised meats and root vegetables. It’s easy to cheat and eat whatever you want 12 months of the year, but it is not the same. There is something so fun about working with ripe fruits. And the local ones taste better. That pencil thing, first-of-the-spring asparagus? When it first comes in we just walk around eating it raw. It just tastes like spring. EDC: But what about tomatoes? Joy: I just don’t serve them out of season. That’s all. EDC: Your contributions to the culinary scene are credited for creating a buzz for the town. Do you think so? And what other ways has Fredericksburg changed? Beth: Well, we see the interest in this old town exploding. People are really celebrating the river [the Rappahannock]; years ago the river as resource didn’t get much attention, but now they have developed all kinds of walking trails and things to do. When we walk Chuck, our dog, it is great to see everyone out running and playing along the riverbanks and that is all fairly recent. I feel like Fredericksburg is becoming one of those great places where you can live, work and play—and I feel like more and more folks in our community are dedicated to balancing their work lives. EDC: What are some of your favorite things to do that we should share with our readers? Beth: Well, a lot of people come here because they love history, they love the battlefields. But let me tell you about Bowman’s Distillery. It is amazing. The grounds are great, their marketing is great, their bourbon is great. Joy: I do feel like Bowman’s borders on a best-kept secret, but it shouldn’t be. They routinely get voted the best bourbon at national award events. It’s very good and worth a visit. Beth: Also, I love the canal path and the Washington Avenue monuments. And we are very big on doughnuts here. It is serious and there is a war going on with the old school, like Paul’s Bakery, and the new kids, like Sugar Shack and Duck Doughnuts. And Carl’s Ice Cream. Joy: Oh, Carl’s. It is amazing. Carl’s is a drive-up ice cream stand from the ’40s and the kids still wear paper caps and shirts with high white dickies. Routinely there are lines around the block on the weekend of hundreds of people. You have to go. EDC: Joy, you were gone six weeks to tape “Top Chef” in 2014. That’s intense and a lot of time for you to be gone. Did that kind of national publicity drive diners to you? Joy: It absolutely gave us a bump in business, and from Richmond and DC. And a bump in criticism. But that’s cool, I’ll take it. It was a small price to pay to get our name out there and to have an experience like that. EDC: Woman bosses in restaurants are way too rare. I have to ask: Is there a difference in restaurants run by women? Beth: Yes. I think it starts with the hiring. We really look for the best, not necessarily in their skills but their attitude. We want everyone to be positive and enthusiastic—attitude is everything. We work backwards from that point. The people we tend to put in power here are people who bring that positive attitude every day. They are passionate. Joy: When we remembered what we didn’t like about male-dominated industries and workforces, we wanted to take away what we didn’t like. It is critical for us to give our employees a voice and something they can buy into. Beth: Joy and I both have very strong mothers who are amazing women and I think how we run our businesses is a reflection of what both of our mothers told us: Bring your best self to work every day. EDC: I know you are planning a next project? Can you tell me about it? Joy: There is a new food hall coming to Fredericksburg, Dominion Public Market, and I can’t say too much, but we’re going to be part of that. EDC: You’ve both been interviewed a lot. What is something you’d like to say about your work or your life that you haven’t been asked? Beth: Two things: One is that I’m thankful for our business partner, Jeremy Harrison. And second, I think it is important to stay humble and appreciative of what we do in a world where food can be expected to be so beautiful and precise. While we might feel that expectation in front of us, we pay our bills here with chicken salad, and I’m very proud of that. Joy: Right. Sometimes you think, “Should I be someplace else?” But I’ve come full circle. The stuff that gets me excited is what also makes me happy—I’m so lucky to be cooking where we live for people we know. We have 70 employees and that is amazing, and I’m roasting local chickens that taste great. What can be better? Giving people jobs, feeding people, cooking the best stuff from farmers down the street. I’m really proud that we cook the food that people want to eat every day. Check out a notable recipe from the duo here! It's National Cheese and Wine Day!